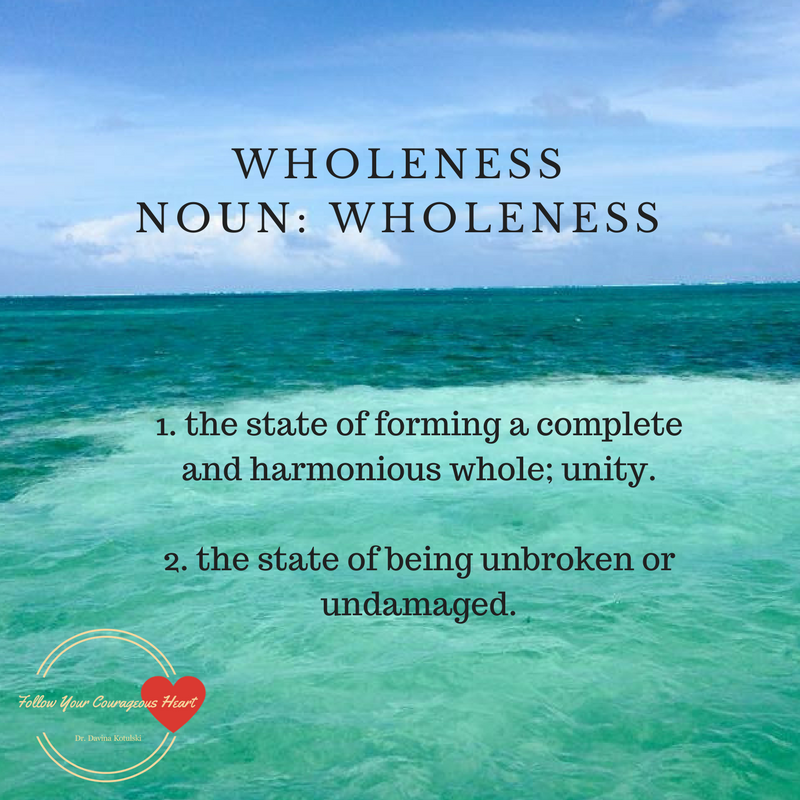 Wholeness – Davina Kotulski, Ph.D. Lately, I’ve heard people expressing that they feel fragmented beyond belief which is an interesting synchronicity since my theme for December is wholeness. With the fires in Southern California, the devastation from the hurricanes, the unknown with every aspect of our government, the daily news about sexual harassment, and of course good old holiday stress, many people feel scattered or like their life is falling to pieces. There’s a Jewish phrase, Tikkun Olam, which means bringing the scattered pieces of life back together, literally repair of the world, to make ourselves and the world whole. How can we be whole with all of this uncertainty? How can we be whole when our things are in a box ready to evacuate? How can we be whole when our houses have been blown down or burnt to the ground? How can we be whole in the midst of medical challenges, relationship endings, family chaos, joblessness, political unrest and upheaval? Here are 9 helpful tips to help you bring back your scattered pieces. 1. We can be whole by taking a step back and embracing witness consciousness. Observe what’s going on around you as if you were watching a drama unfolding on TV or as if the events and people were character’s in a book. This is a way to get perspective. It is not intended to disconnect you from empathy, or for you to deny or repress your feelings. It’s a way for you to look at the bigger picture. 2. We can be whole by finding moments of stillness. Take time to rest, meditate, and simply sit still. 3. We can be whole by doing less. How many times do we try to do too much? Take on too much? Say ‘yes’ to too much to make others happy? 4. We can be whole by slowing down. When we slow down, we give others permission to slow down. We can teach our children to be with what is, rather than feeding their ’empty ghosts’ which are constantly seeking distraction and craving something to fill the empty spaces. 5. We can be whole by refraining from self-negating people pleasing behaviors. Stop trying to impress everyone and stop trying to please an ego that will find fault no matter what we or others do. 6. We can be whole by enjoying simple moments of joy. Bright lights and greater spurts of adrenaline producing activities are addictive and do nothing to connect us to our authentic selves. Instead of seeking spectacle and bigger productions of entertainment, enjoy simple moments of connection, laughter, a sunset, a good meal. 7. We can be whole by coming back to our breath and our bodies. and connecting with the natural elements. Going for a walk in the woods or along the beach. Sitting by a lake, a stream, or a fountain and hearing the soothing sounds of water. 8. We can be whole by taking a time out. We need time and space to restore ourselves. We need time to bring ourselves back together again. We need to say ‘no’ sometimes to others requests of us and ‘yes’ to our sanity and health. 9. We can be whole by being kind to ourselves and others. This means speaking more gently to others. This means loving self-talk. Bring the good cheer this holiday season, by slowing down and being someone who relishes the simple joys, focuses on loving thoughts of yourself and others, and speaks kindly and encouragingly to those you encounter. Sign up now for your FREE GIFT. Claim your virtual seat at the I AM Symposium. Join me and 21 other wisdom leaders for a celebration of solstice, bringing back the light and shamanic wisdom. Register now! Previous PostPrevious What are you holding on to that no longer serves you? Next PostNext Follow Your Heart!